Motivate your company, empower your team and improve decision making with real time data and information. Userful's software takes an off-the-shelf PC and turns it into a high-end video wall controller. It includes all the key features to quickly and easily control and display multiple content sources on the video wall in a flexible way. Manage and control the solution through the cloud or for sites with no internet connection, using the Local Area Network (LAN). Zones, multi window and and picture-in-picture make it easy to display multiple desktops, dashboards and other sources. Enable multiple team members to control mouse and keyboard of the video wall for easy collaboration. Create one of a kind video walls that enhance your lobby and greet your customers. Quickly and easily connect one or more laptops or desktops from anywhere in the office. Deploy individual displays, digital signs, dashboards and video walls throughout the office all from the same PC. Empower your team with easy to use tools collaboration for small group spaces. Empower business leaders with the tools to share their ideas clearly and easily. Eye catching artistic video walls help deliver your message and promote your brand and products when visitors come on site. Digital signage is a proven way to engage an audience and deliver a message. Use displays or video walls to help communicate, inform and motivate your team. Book a time with a Userful expert now. Click here to set up a personalized 1-on-1 demo. "What I like about Userful is that not only did it fulfil all our requirements but it did so at a great price." Userful offers Straightforward, pay-for-what-you-need pricing. Don’t overpay for your video wall solution. Talk to a Userful Team Member. 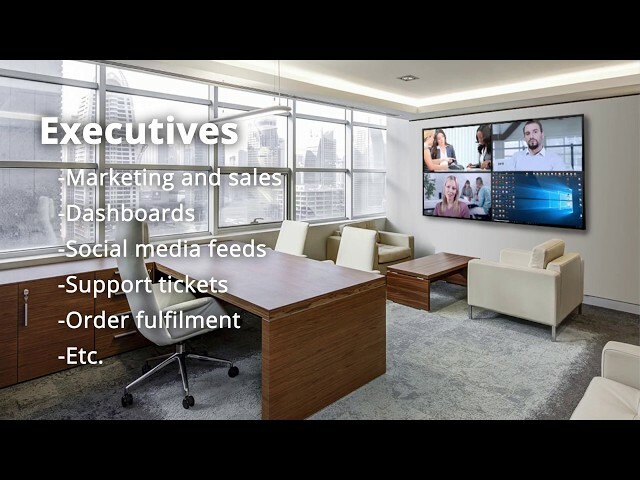 Book an instant meeting with one of Userful’s Video Wall specialists. Contact sales for a personal online demo and pricing presentation today. Get an instant email with Userful’s complete pricing.